I'm so happy to be announce that our very first grandchild has arrived. She is a beautiful baby girl, 7 lbs 9 oz, and her name is Alethea. Everyone kept asking me before Alethea was born if I was excited about being a grandmother. My answer was always "No". I was never the woman who desired grandchildren nor have I ever pressured my children to give me grandchildren. I was quite happy with our little family of five and didn't want it to change at all (well, a sweet spouse for my son would be a nice addition...still praying for that!) But the second I saw Alethea and held her in my arms, everything changed. I fell madly and completely in love with this little pumpkin. 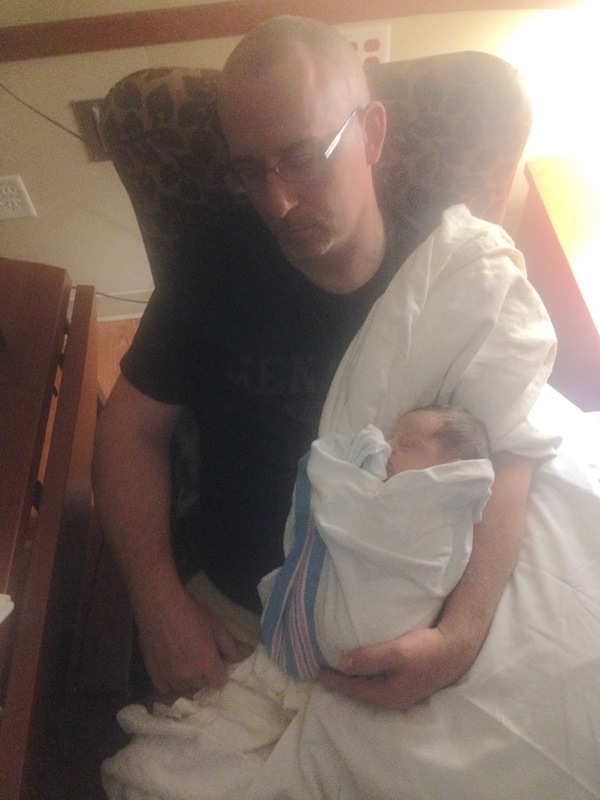 My daughter lives about six hours away from us and from the minute she announced her pregnancy we worried how we would get to the hospital in time to hold Alethea before anyone else got there. (Yes, I was selfish, I wanted to be the first grandma to hold Alethea, and I was!) However, I didn't need to worry about that, as Alethea took her sweet time getting here! Ashley started experiencing mild contractions the night before, then in the morning her water broke so she was admitted to the hospital around 10:00 a.m. It was a weekday, so my husband was at work. I called him and told him we needed to leave a.s.a.p. By the time he got home (he works about an hour away) it was afternoon. We arrived in Illinois around 8:00 pm. and Ashley still hadn't given birth. I was clearly in panic mode. I recalled my own childbirth experiences, and I had always given birth within a few hours of arriving at the hospital. I kept wondering what was wrong. We wanted to go to the waiting room of the hospital, but Ashley and Jason insisted we go to their apartment to get some sleep and they'll call when the baby was born. Sleep! Who could sleep? I was worried to death. What was going on? How could she possibly be in labour this long? I just lay there all night long praying and praying. I texted Jason a few times, but received very little details, which caused me to worry more. I think I only slept two hours the entire night. Finally, around 3:22 a.m., Alethea was born! I was never so happy and relieved in my life. Jason said they would be out of recovery and in their room around 6:00 a.m. and we could visit her then. Of course, now we were too excited too sleep, so we just got up, went out for breakfast, and headed to the hospital. When we arrived at the hospital the nurse said they were just getting Ashley settled into her room and they asked us to wait in the waiting room. More waiting? I couldn't take much more! Then after what seemed to be an eternity another nurse came out and said Ashley was exhausted and needed to sleep for a few minutes before we could go in to see her. At this point, I was ready to kill somebody. I had no idea what had happened to my daughter and why the labour went so long. All I knew was that the baby was "perfect". The nurse would only say Ashley and the Baby were doing well but she wasn't allowed to give me any details; you can just imagine where my mind went. Finally (after what seemed to be an eternity) Jason comes running out of the maternity wing arms outstretched for a hug and I said "We're mad at you". LOL! If you could have seen the quizzical look on his face. Clearly, he had no idea what he we had been through the past 24 hours. He quickly explained that the reason he didn't text more details was that he didn't really have any. Even though Ashley's water broke early in the morning, her real labour didn't even start till after 10:00 p.m. It was just a long day of waiting for the labour to progress. All was forgiven once I saw little Alethea and held her in my arms. Oh, what a sweetheart! When I first arrived in the room, Alethea was wide awake, laying in her mother's arms, and just staring into Ashley's eyes. She was making the cutest facial expressions! I've never seen such an alert newborn baby before. Ashley attributes that to the fact that she had a natural childbirth. Isn't she just a doll? She resembles her father so much, it will be interesting to watch her grow and see what attributes of Ashley's develop. My husband was afraid to hold to her, no matter how much coaxing we did. Finally, on day two he asked to hold her (small miracles! ), then he wouldn't let her go and held her more than anyone! We spent only a few hours at the hospital because Ashley and Jason were just exhausted after being up all night long. So we left for the day to let them get a few hours sleep, and promised to return later that evening with our son Jordan (who still hadn't seen her yet because he was at work). Unfortunately, Ashley and Jason who thought they would have all day to sleep, ended up only getting 45 minutes of sleep because doctors and nurses were constantly coming into the room all day to check up on them, do tests, etc. They were totally and completely exhausted after going now almost three days without sleep. When we arrived back at the hospital and found out that they still didn't get any sleep we said "You're kidding? You mean we could have spent the day here instead of trying to kill time all day! ". We did have a fun day, but of course we would have rather spent the day with our new granddaughter instead. We found a pretty wooded trail to walk on, then we headed to the outdoor mall (Oakbrook Center) I love to visit whenever I'm in Wheaton. We purchased the cutest white eyelet dress at Baby Gap to take Alethea home in. Then we enjoyed a nice lunch at California Pizza and ended the day by watching the latest "Pirates of the Caribbean" movie. As soon as the movie ended, I looked at my phone and there was a text from our son Jordan wondering where we were as he was already at the hospital. Thankfully, the hospital was only a five minute drive from the mall and we were back there in minutes. Our son Jordan had never held a newborn before, so the expression on his face tells it all! He didn't know what to think of this peculiar new creature. He said "I can't believe this came out of you! She's a little person". It reminded me of the old Dr. Seuss storybook quote "A person's a person no matter how small." Well by now we were the only people who had seen the baby, so we had to leave to allow Jason's side of the family to visit. Jordan went to his usual Thursday night bible study, and we just headed out for dinner and then back to the apartment to get some rest...as we hadn't slept much in the past few days either! Unfortunately, I still didn't get much sleep because Ashley kept texting me throughout the night waking me up! The poor thing couldn't sleep because Alethea wouldn't sleep. The nursery in the hospital wasn't adequately staffed enough to take Alethea off Ashley's hands so she could get some rest. Alethea wouldn't sleep in her crib in Ashley's room. The second they put her down, she cried. She just wanted to be held. So Ashley texted that she would like us to come back to the hospital first thing in the morning just to hold the baby all day so she and Jason could get some rest. We were more than happy to do that, and Grandpa figured out how he could safely hold Alethea so they both could sleep at the same time. Unfortunately, yet again, doctors and nurses were constantly coming into the room throughout the day so Ashley still couldn't get any sleep. Why do they do that? By now, Ashley was so exhausted and just wanted to go home so she could get some sleep. She even considered not staying the full two nights in the hospital and going home early. We encouraged her to stay, just to be safe, and to try and leave first thing in the morning instead. The second night was better for her as a lactation nurse showed her a way she could lay with Alethea in bed so they could both sleep. Finally the day arrived when we could take Alethea home! I was given the honor of putting her in very first dress and hair bow. I couldn't believe how small she was! She seemed to drown in her newborn gown. We had such bad lighting in the hospital that we never really got any good pictures, so we decided to take advantage of outdoor lighting and a pretty seating area on the hospital grounds, to take some family photos. We never planned on taking family photos, so our outfits were not planned out in advance, but I chuckled after I saw this photo how good it looked because they were all color coordinated! It made me wish I had worn black too! My outfit was not suitable for family photos, but I was dressed for the long six hour car drive home, not for a photo shoot! Alethea slept through the entire photo shoot, so we got some nice pictures! Three generations of Johnson women....the circle of life....such a marvelous, wonderful thing! I was so happy I thought of stopping and capturing these moments. It was such a special time and wonderful way to celebrate Alethea's birth! My husband saw Alethea was just about to yawn and caught this cute picture of her opening wide. Priceless! When we got back to Ashley and Jason's apartment, I realized we didn't take any pictures of my husband and I together with the baby nor Jordan. So I asked Jason to take some family pictures of Ashley's side of the family. Hopefully Ashley will get Jason's side of the family with Alethea if and when they are all together at the same time. Ashley with her brother Jordan. By now we had been away from home and and our cat Jackson three nights so it was time to give Alethea a kiss and say goodbye. It was so hard...I hate living so far apart from her. I already made plans to go back at the end of the month to see her again. I now know what everyone meant when they told me before Alethea was born that I would love being a grandmother....because I do! She is such a precious gift! Congratulations, your daughter looks great despite the lack of sleep! Thank you! Yes, she did! I don't know how she always looks so beautiful! Oh my, Alethea is so beautiful. It brings back memories from my own birth (my daughter is 14 months old). And I love her name. God bless her and your whole family. Thanks so much! I'll check out your link up! So sweet, Amy. 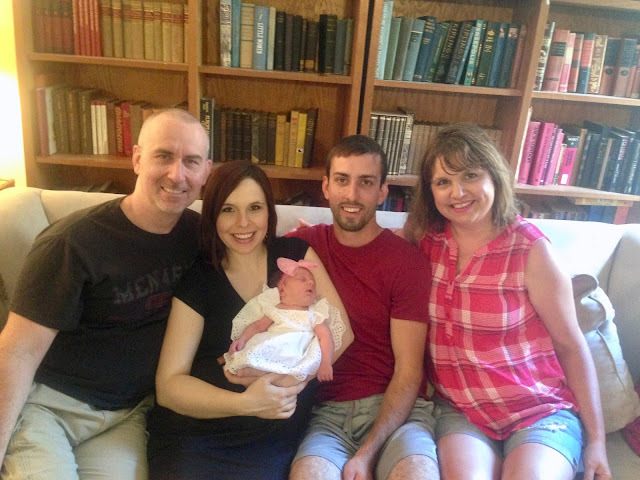 I enjoyed reading about Alethea's birth story from your perspective. I know you are going to enjoy spoiling her rotten! Thanks Jennie, I though people might find it interesting reading a birth story from a grandparents perspective. We usually only get the parent's side of the story. Such beautiful pictures Amy. She is gorgeous! Congrats again to all of you! It's good that they don't live clear in Florida anymore, so you can visit more often. Thank you Elli! If they still lived in Florida, I definitely would of racked up the frequent flyer miles! YOUR BEST POST EVER!!! Oh, my gosh. You guys did good. What a darling baby. Baby girls are so fabulous. Just ask me, I have two daughters and two granddaughters. I enjoyed every word, every photo and every emotion in this post. Congratulations, Amy. So happy for all of you. Alethea is a delight. Welcome to the world, baby girl.